Pat Rice (who was born on 17 March 1949 and who has just left Arsenal, after a lifetime’s service), made his first-team début in the League Cup match against Burnley on December 5 1967. I believe that the game against Norwich last week is counted as his last match. An astonishing man, an astonishing record. I feel very much moved to write my own tribute to Pat because at the moment with colleagues I am working on a book of Arsenal in the 70s, of which Pat was very much part. 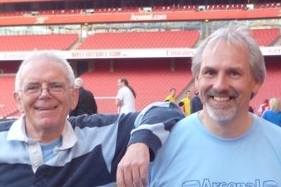 What’s more my dad and my uncle – solid north London men both – both told me about meeting Pat. Of course they would remember meeting such a famous guy – Pat wouldn’t – but that’s how it goes. Thinking of those games, one thought has come back to me: what was Pat’s song? Did he have a song? If he did you’ll have to remind me, because I have forgotten it. Pat played 397 games for Arsenal and scored 12 goals, before going to his only other club: Watford, for whom he played 112 times. He also played 49 times for his country: Northern Ireland. Pat worked in a greengrocers on Gillespie Road (you can’t get much closer to the old stadium) and became an apprentice in 1964, and a pro in 1966. Like most players who have come up through that route he played just a few games in his early years, but even so he was picked for N Ireland in 1968. Eventually when Storey moved into the centre of midfield to become the ultimate enforcer Pat took over at right back. He won the Double and had three seasons where he played every game. He was the last of the 70/71 side to leave the club, and was made captain – and as such was presented with the FA Cup in 1979. He played in five FA Cup finals and the Cup Winners Cup final. He left us in 1980 and helped Watford gain promotion to the First Division, again playing as captain. He retired from playing in 1984. So, 1984. Pat came home, and was youth team coach, a job he kept until 1996. He won the Youth Cup twice. And then the big time: he became manager after Houston resigned (Houston was caretaker after Rioch had been sacked. He managed three league games – and won the lot, and I remember saying to my old pal Roger at the time, “that makes him not only the best right back we ever saw, but also the most successful league manager.” OK, not very funny, but if you’ve been involved at times with long journeys to games you’ll know how the conversation goes. Then along came Arsène Wenger who made Pat his assistant manager and that led him to being one of only two men who have been part of the three Doubles. The other of course is Bob Wilson. At the end of the 2010/11 season it was announced that Pat was about to retire, and the disgraceful AAA ran stories that Pat could no longer stand working with Mr Wenger. But Mr Wenger got Pat to do one more season – and now he steps down after 48 years service to the club we love. In tribute Mr Wenger has said, “‘Pat is a true Arsenal legend and has committed almost his whole life to Arsenal Football Club, which shows huge loyalty and devotion to this club…I will always be indebted to him for his expert insight into Arsenal and football as a whole. On the training pitches and on matchdays, Pat has always been a passionate, loyal and insightful colleague, who we will all miss. “He’s just been tremendous. It’s a sad, sad, sad day. His life was linked with Arsenal and Arsenal have been privileged to have him as a player, a captain, a coach, and personally I’m very grateful for his contribution to my period here. “I would like him to forgive me the bad moments I’ve given him as well, Mr Wenger added. “He’s been a constant, loyal supporter. I’m just very grateful and privileged to have had him at my side for such a long time. So we have one of those moments. I know Pat won’t read this – there will be far too many tributes and the like, but I hope that maybe when the book comes out he might get hold of a copy of Arsenal in the 70s, because we have recorded there a few glorious moments of his defending. Thanks Pat, it has been an honour to watch you play and to see the throughput of your work with the youth team, and alongside Mr Wenger. Beautifully put. Well done Tony. A couple more things to add. A piece of useless trivia. Pat’s brother had a barber shop in Drayton Park. As you turn from Gillespie Road into Drayton Park there is a small white building between two town houses – that’s where it was. My own small experience of meeting Pat Rice was about 20 years ago when I visited Highbury to renew my season ticket. Pat Rice happened to be in the Marble Halls and not only did he sign my booklet but stood talking for 5 mins or so even though I am sure he was very busy. A class act and in my experience a gentleman. Thank you for that tribute to him – it is well deserved. And a big thanks to Patrice from me (for what it’s worth). I, too, saw him play many times and knew, every time I saw him, that he would be a solid performer for us. I assume that you listen to the Alan Davies podcast! One other thing, he also turned out for my brother’s pub team who played in Finsbury Park. Not sure how Bertie Mee would have reacted if he’d found out. Clem Cattini, there’s another name connected to the Arsenal that doesn’t get enough recognition. For those who haven’t heard of Clem he has had Arsenal’s trainees lodge with him for years. Before he became a mentor to the stars of the future he was one himself. He rose to fame as the drummer of The Tornados who had a number 1 hit with “Telstar” in 1962 (It was also the first single by UK group to be a US number 1). Clem then became a session drummer and holds the recored for having performed on most UK number 1s. It’s also alleged that he turned down an offer to become drummer with Led Zeppelin. yes he had a song”pat rice tastygoal” he scored a twenty yarder at reading in the fa cup.regards ted.